In the foreseeable future, development of compact camera modules will be deeply influenced by growing integration of cameras and image capturing technologies in the core functioning of electronic hand-held devices such as smartphones and tablets. Leading manufacturers of compact camera modules are focusing on extending the resolution envelope by capitalizing on the increasing demand for advanced camera module technologies in the consumer electronics industry. Companies namely, LG Innotek, Semco, Foxconn Sharp, O-Film, Sunny Optical, Henkel, Liteon, Menex, Q-tech and Cowell, which are observed as the global leaders in compact camera module manufacturing are pushing the reliability of their modules and extending the camera module functionalities to capture the changing interests of end-users. Transparency Market Research observes that these companies will actively partake in the expansion of the global compact camera module market during the forecast period, 2017-2026. According to the report, the global compact camera module market will witness a robust expansion at 12.1% CAGR in terms of value over the forecast period. It has been estimated that by the end of 2026, more than US$ 92.8 Bn worth of compact camera modules will be sold across the globe. In the approaching years, the compact camera module ecosystem will witness a growing demand for back-end camera modules. Several electronic devices will witness integration of backside camera modules with their electrical mainframe. With respect to such growing demand, majority of market players will be focusing on extending the production of compact camera modules with auto-focus lens. By the end of 2026, more than 70% of compact camera modules sold in the global market will be equipped with auto-focus lens. The report further reveals that the demand for compact camera modules with fixed-focus lens will dwindle towards the end of the forecast period. While high-growth sectors such as automotive and consumer electronics are observed as the key end-user industries of compact camera modules, their adoption continues to vary on the basis of type of assembly, camera module technologies and lens bonding materials. In 2017, more than US$ 25 Bn worth of compact camera modules will be sold in the production of mobile devices. The report further projects that the mobile end-use of compact camera modules will register an impressive revenue growth at 13.1% CAGR over the forecast period. 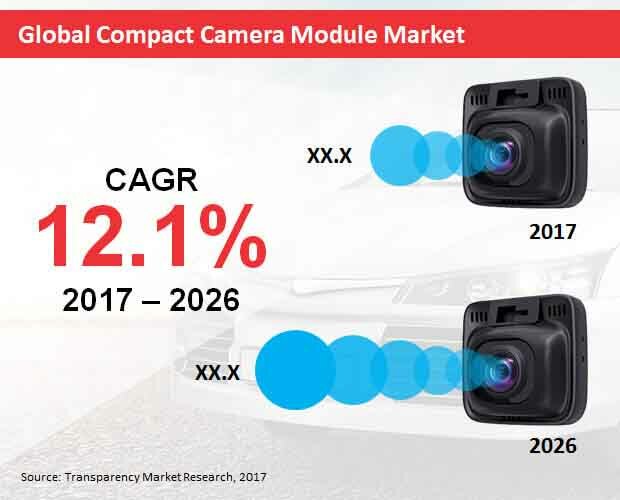 Meanwhile, automotive end-use of compact camera modules will gain steady traction and bring in revenues worth over US$ 5.5 Bn by the end of 2026. In terms of regional expansion, the global market for compact camera module will witness a concentered growth in the Asia-Pacific excluding Japan (APEJ) region. By the end of 2026, the APEJ compact camera module market is pegged to be worth nearly US$ 40 Bn. High presence of consumer electronics manufacturers in Taiwan and other parts of the APEJ region will continue to bolster its growth in the global compact camera module market. In addition, explosive growth registered in APEJ automotive industry will further support a greater automotive end-use of compact camera modules in this region. North America and Europe are also expected to be at the forefront of the global compact camera module market expansion through 2026.